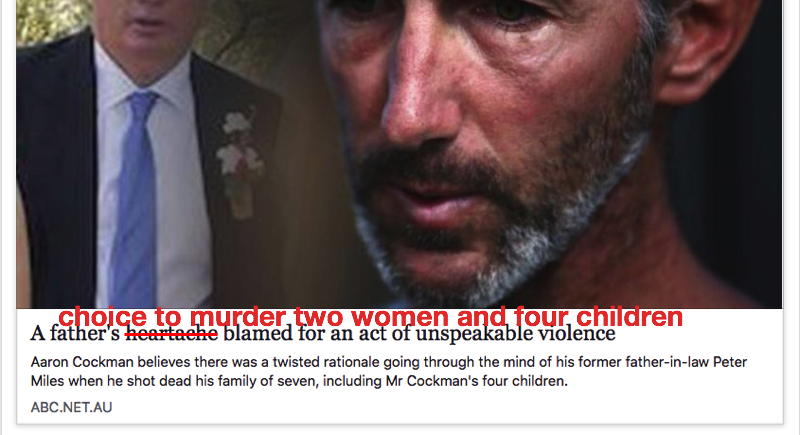 The ABC reported that the father of the children killed at Margaret River last Friday held and impromptu press conference about the shooting. The Facebook lead for this article blamed the murder of two women and four children on “heartbreak”. Heartbreak does not cause murder. There is only one thing that causes murder – the choice to kill someone. It is never ok. I know It isn’t easy for journalists to report something like the public statements made by Aaron Cockman. A grieving father who wants to tell his story should not be ignored, but it’s also impossible to believe that he has had time to process the murder of his ex-wife and four children only a few days ago. He’s is shocked and grieving, it would be grossly unfair to expect he should have thought through all the implications of every word and phrase he utters. Journalists cannot rephrase or add to his statements. They can, however, provide some context and at the very least, include the suicide helpline information as per the APC standards for reporting on suicide. The context required is a reminder that men don’t own women and children. Men who decide to suicide are not entitled to also take the lives of their wives and children. Those lives are not theirs to take. Murder is never justified. Men who kill women and children because they think they are entitled to “take them with me” are not tragic heroes or loving fathers. No responsible media outlet would call a suicide bomber who killed children a passionate political activist. They’d call him a terrorist and there would be no mercy in the comments section for anyone who tried to defend him. A suicidal man who kills women and children is no less abhorrent than the suicide bombers we so unhesitatingly label as terrorist. Being related or married to women and children does not give any man the right to take their lives. There is no excuse. There is no justification. A man who kills women and children, even if he then kills himself, is a murderer and an intimate terrorist. He does not get a pity pass.